Clevelanders are known for our grit. We fight for what we believe in … and right now, there’s plenty to believe in. But that’s only half the story. Nearly 40% of Clevelanders are living in poverty. Almost 60% of Cleveland’s children live in poverty. This is a reality we must face long after the crowds have disappeared. Poverty is a formidable foe … but Cleveland is a city of fighters. Many partners throughout this city and beyond are working to make real impact through: Quality education | Safe, healthy and affordable housing | Food security | Quality, affordable health care | Job creation, preparation and access. You can help. Join us in elevating the issue of poverty. Speak up and tell our nation’s leaders that by working to eradicate poverty, we lift up entire communities. Send a letter to elected officials! Easily view a template letter, personalize and send it to your elected officials through our advocacy website. Share the social media posts from our collaboration of partners behind this effort! 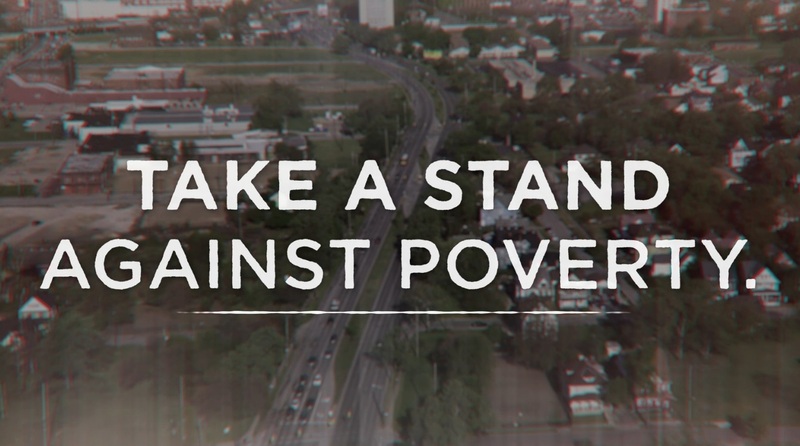 Take a stand against poverty. Join the conversation. #SpeakUpCLE. Since 1996, the Sisters of Charity Foundation of Cleveland has partnered with residents, nonprofits and community leaders to change the trajectory of poverty in Cuyahoga County. Its nearly $100 million endowment includes the first health care conversion foundation and first foundation formed by a congregation of Catholic sisters in the United States. Through grantmaking, collaboration advocacy and more, the Sisters of Charity Foundation of Cleveland works to improve the lives of those most in need with special attention to families, women and children living in poverty. The foundation works to end homelessness in Cuyahoga County and to reduce health disparities and improve educational opportunities in Cleveland’s Central Neighborhood. As a Catholic organization, the foundation extends the values of Jesus Christ through the mission of its founders – the Sisters of Charity of St. Augustine – and also works to sustain the ministries of women religious.